The new partnership will position diesel generator expert Fischer Panda as the prime supplier for marine and mobile power solutions at next year’s London Boat Show where it will be able to offer visitors the full system integration package incorporating both Mastervolt and CZone products. 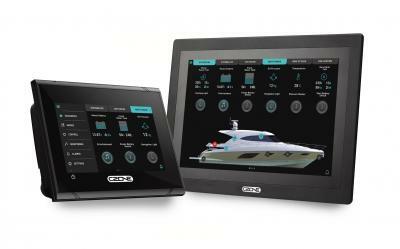 CZone digital switching enables boat owners to simplify their boat’s electrical system by managing on-board equipment, such as generators, watermakers and HVAC, and changing the environment via a single touch-screen display or wireless device. As a leading supplier of its renowned quiet-running gen-sets, as well as HRO/Village Marine and Sea Recovery watermakers and Dometic air-conditioning, Fischer Panda UK can now offer its compatible Mastervolt power solutions and CZone control and monitoring functionality for customised system integration around a Fischer Panda generator purchase. This integrated system approach applies across all three of Fischer Panda UK’s core markets - Marine, Specialist Vehicle and Military. Chris Fower, Marine Sales and Marketing Manager, Fischer Panda, said: “We are really pleased to be able to offer the leading CZone solutions which mean that we can help make it easier than ever before for boat owners to maintain oversight of their vessel’s systems. Not only does CZone allow boaters to benefit from system-wide integration of onboard systems, but it will also resolve and potentially prevent future issues. Partnering with Mastervolt, CZone offers the most comprehensive power monitoring and control with any digital switching alternative. The CZone digital control and monitoring network simplifies installation of electrical systems through the replacement of complicated, cumbersome wiring to switch and fuse panels, with state-of-the-art, robust interfaces and light NMEA 2000 network cable. Fixed control through digital push button switches and intuitive touch screen displays removes unnecessary panels of individual switches. CZone’s new Combination Output Interface (COI) is a complete system that combines 5 CZone modules into a single module, for faster installation and smaller footprint, making it ideal for smaller vessels. Fischer Panda customises engineered Mastervolt power solutions for boat owners with or without generators, including a one-off inverter or battery charger, or a fully integrated system. With a power range from 300W to 40kW, the choice ranges from the latest Lithium-Ion technology to Gel and AGM lead acid service batteries. In addition, as distributor for Bellmarine electric drive systems, Fischer Panda can also offer compatible Mastervolt solutions for complete and fully-integrated electric propulsion systems. CZone is part of Power Products LLC, which includes Ancor, BEP, Blue Sea Systems, Lenco Marine, Marinco, Mastervolt and ProMariner which have provided innovative electrical solutions as independent companies for decades. To see Fischer Panda UK’s CZone and Mastervolt marine power solutions, visit Stand LC028 at next year’s London Boat Show at ExCeL London from 10th to 14th January.